Oceanfront mid-century back-to-the-basics beach house for those who genuinely want to unplug, unwind, and put nature at the forefront. This vintage knotty-pine cottage is not air conditioned, but if does have ceiling fans in every room, cable TV, and Wi-Fi. 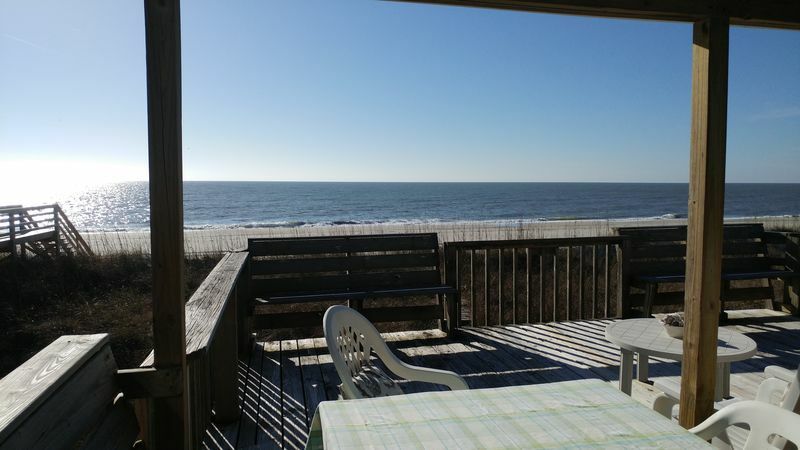 Unbeatable ocean frontage is ideal for those who want all beach all the time – like camping in a cottage! This 4 bedroom / 2 bath house sleeps 9: Queen, Double, Double & Single, and Double & Bunk bed. Other amenities include two covered porches, an enclosed outdoor shower, dishwasher, microwave, washer/dryer, extra fridge and storage.